First Baptist Shreveport is located at 543 Ockley Drive. From I-49, take exit 203 for Pierremont Road/Hollywood Ave, then turn onto Pierremont Road. Continue straight on Pierremont Road to Line Ave. Turn left onto Line Ave. Continue straight on Line Ave. for 0.9 mi. Turn right onto Ockley Dr. First Baptist Shreveport is located between Creswell Ave. and Gilbert Dr.
A free shuttle service runs from the Madison Park Business Center parking lot on Slattery Blvd. off Gilbert Dr.
SSO Patrons can park in the two lots highlighted in orange on the Madison Park parking map. The front lot facing Gilbert Dr. is reserved for customers of Madison Park businesses. Valet service is available at the front of First Baptist Shreveport for a charge of $10. 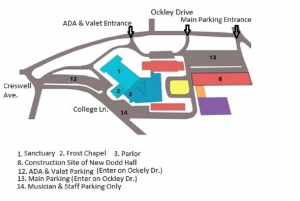 The driveways to the Main Parking lot, Handicap (ADA) Parking, and Valet service are located on Ockley Drive. Entry #1 – Turn right from Ockley Drive into the driveway just before Highland Ave, then keep left to the Main Parking lot. Entry #2 – Turn right from Ockley Drive into the driveway at the corner of Ockley Drive & Gilbert Drive. #12 – Handicap (ADA) Parking w/ permit tag only – Turn right from Ockley Drive into the driveway just before Highland Ave, then keep right. 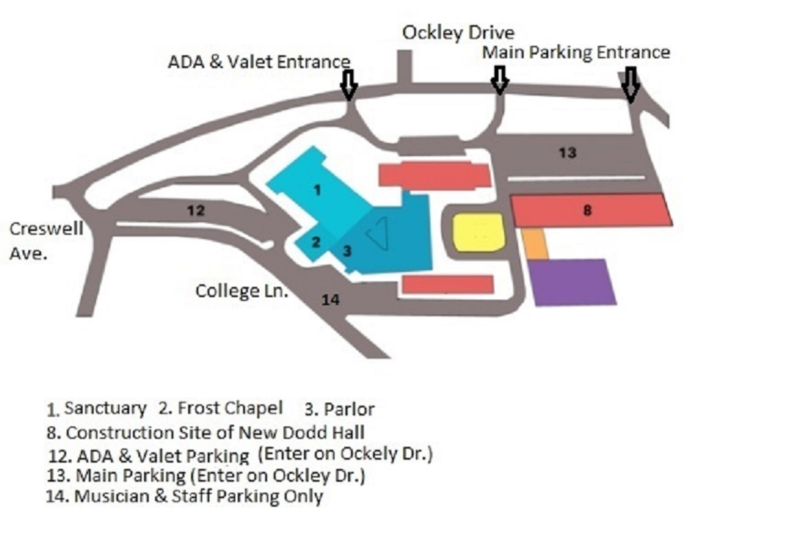 #12 – Valet Parking Entry – Turn right from Ockley Drive into the driveway just before Highland Ave, then keep right & follow signs for Valet service.